This article was peer reviewed by Agbonghama Collins and Martín Martínez. Thanks to all of SitePoint’s peer reviewers for making SitePoint content the best it can be! One of the most common task for a web application is to save data. Without the ability to store data, users would not be able to customize their preferences for an application, organize their data, or achieve similar tasks. For a long time, the web has relied on relational database to save information. For example, on the web the liason between PHP and MySQL is well known. But not all the database must be relation! In this article we’ll focus on using RethinkDB, an open source JSON database, with Node.js applications. We’ll make use of the RethinkDB Node.js driver called rethinkdbdash to connect to the database. But before starting, let’s have a look at what RethinkDB is and where we might want to use it. RethinkDB is an open source JSON database built for real time Web. RethinkDB is the first open-source, scalable JSON database built from the ground up for the realtime web. It inverts the traditional database architecture by exposing an exciting new access model – instead of polling for changes, the developer can tell RethinkDB to continuously push updated query results to applications in realtime. It provides the functionality to get real time updates from the database each time a change occurs. RethinkDB targets applications which require to send real time updates to the connected clients. For example, let’s consider an application that enables users to collaboratively design a plan. When a particular user makes a design change, it needs to be pushed to the other connected clients in real time to keep the design in sync. RethinkDB can be used in such cases to make real time updates possible. Having clarified what RethinkDB could be useful for, let’s seen now how to install it. To install RethinkDB on Ubuntu, you need to add the repository. Then, you have to update the package information from the newly added repository and install RethinkDB. For other OS flavors, you can follow the official installation instructions. If everything is installed correctly, RethinkDB should start and it should run on the default port 28015. 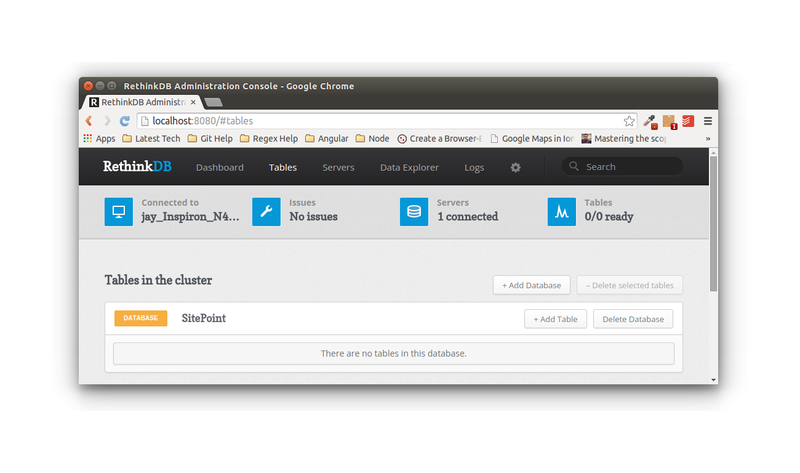 The administration console should be accessible at http://localhost:8080. In the introduction of this tutorial, I have mentioned rethinkdbdash, the Node.js client we’ll use for interacting with the RethinkDB server. It is an advanced Node.js driver for RethinkDB with a connection pool, support for streams, etc. We’ll start by creating a database called SitePoint for our demo app. As the first step, create a project folder called NodeRethinkDB. Then, create a file called app.js inside the project directory. With the previous statement in place, we can create a database. This is done by using the dbCreate method. If everything went fine, you should get a successful response as the one below. If you take a look at the RethinkDB administration console running at port 8080, you should be able to see the newly created SitePoint database. Now we’ll see how to create a table in a RethinkDB database, using the rethinkdbdash client. First, set up a connection to the database using the client. Now, we’ll make use of the tableCreate method to create a table Employee in the database. By default, the primary key is id. If you want, you can specify it while creating the table. To insert data into the Employee table, we’ll make use of the insert method. One thing worth noting in the insert query is that we haven’t specified the id field. If we prefer, we can do it. Otherwise, it will have an autogenerated unique identifier value. Selecting data from the table is quite straightforward. We need to specify the name of the table and the data gets selected. Instead of polling for changes, the developer can tell RethinkDB to continuously push updated query results in realtime. The above log is for an insert statement, hence the old_val is null and new_val has value. In case an existing record gets updated, we will have both the old_val and the new_val. In this tutorial, we’ve seen how to use RethinkDB with Node.js applications thanks to the RethinkDB Node.js driver called rethinkdbdash. Have you ever used any other client for connecting to RethinkDB from Node.js?